Tarzan is the ruler of the jungle – the animals are his friends and roam the wilderness with him. 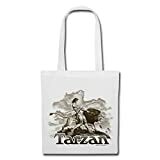 An official product from the Tarzan collection by Spreadshirt.A bag just in case. This classic tote bag carries your groceries, text books and everything else you can easily strap around your shoulders. Handle length: approx 12″ (30cm) Holding capacity: 10 litres Light consistency: 140 g/m² Fabrics: 100% cotton. Once your purchase is complete, we print your product, just for you. This is how we provide one-of-a-kind articles that our customers love. An added benefit: On-demand printing reduces waste and is environmentally friendly!.